Listen to "The Demon in the Freezer: A True Story" on your iOS and Android device. Usamriid went into a state of Delta Alert on September 11 and activated its emergency response teams when the first anthrax letters were opened in New York and Washington, D.C. Preston reports, in unprecedented detail, on the government’ s response to the attacks and takes us into the ongoing FBI investigation. His story is based on interviews with top-level FBI agents and with Dr. Steven Hatfill. Authors made a chilling case for smallpox as the most dangerous biological weapon. Author described actual incidents and leaves you wondering who or what is going to use the virus in the U.S. Well read - easy to listen to. This is an incredibly interesting book! I learned so much! It is frightening to think this could happen to the world some day! 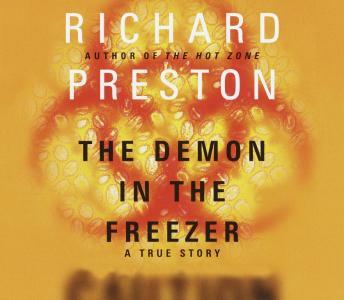 Demon in the Freezer contains some very interesting information about anthrax, smallpox and other horrible diseases. It offers details about what happens when a human being contracts one of these diseases. At times it is disgusting, but the disgusting portions are punctuated with long episodes of tedium. My biggest complaint is that it tends to wander from one story to another without coming to a conclusion. There is quite a lot of scientific data that is explained in excruciating detail - far to technical for my simple mind. This book was not what I expected it to be. I work in Public Health and this was interesting to me for that reason. We have had drills if there were an outbreak of small pox. Alot of history and technical items.